Menu results may contain several results that represent the same piece of content. Menu results are not unique, Menu results may include multiple results representing the same piece of content as the results can include content and content links. For example, several content links to the same content may appear in the results for a single menu. It may be desirable to filter these duplicate results, to leave only one. Following configuration property used to define whether menus should allow duplicate results. If the property is set to false, duplicates will be filtered from the menu results prior to rendering. "menu.cache.max.items" setting is different from the "services/cache/iwk/menu" , I mean "services/cache/iwk/menu" max size by default 2000, but "menu.cache.max.items" determines how many items in each entry can hold. 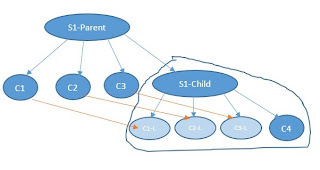 Sitearea "S1-Parent" has following children i.e. content items (c1, c2, c3 ) and sub sitearea called "S1-child"
1. do you have the "allowDuplicateResults" setting? is it global setting or per request setting? 2. check menu.cache.max.items in WCMConfig service, assume if it is 300 and if menu returns more than 300 items then menu doesn't filter the duplicates, in this case you have to increase menu.cache.max.items size. How to impose filtering over the results of wcm menu components with wcm pagination and not clientside pagination? I have a question regarding the content which uses the menu component rendering is not updating like images while moving publish content to draft stage.